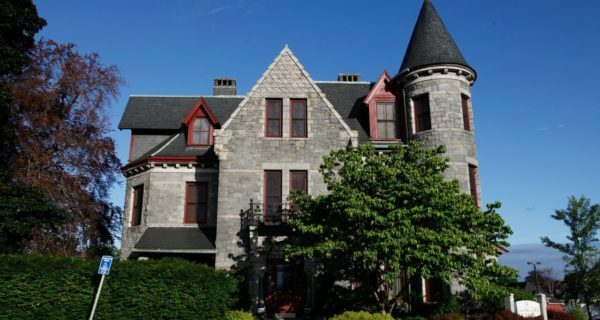 51 Harvard Street, known as Whitcomb Mansion, was designed by Stephen C. Earle, a 19th century architect who designed a number of buildings in Massachusetts and Connecticut, with several located in Worcester. Whitcomb Mansion is a Queen Anne style high Victorian mansion that was built in 1879. The three-story granite structure is listed on the National Register of Historic Places and is one of the few surviving houses that were designed by the noted architect. The interior of the building is decorated in a variety of exotic woods including cherry, ash and maple, along with decorative finishes throughout, including several fireplaces that are enhanced by unique hand laid tile finish. The property has been extremely well maintained throughout and has meticulously maintained grounds. The building has been converted into commercial office space, currently serving as the headquarters for Quaker Special Risk. Adjacent to the mansion is a well maintained two-story carriage house that similarly has been converted into administrative office space, along with a sizable commercial kitchen that provides ample space for catering and functions. Additional amenities include on-site parking, exceptional highway access (Routes 9 & 290), great visibility and curb appeal along heavily traveled Highland Street. The property is available for sale and will be vacated in June 2019 +-.